An American woman and her family who was freed from the custody of a Taliban-linked group in Pakistan arrived in Canada on Friday, and her husband said the insurgent group killed their infant daughter during the five years they were held hostage. 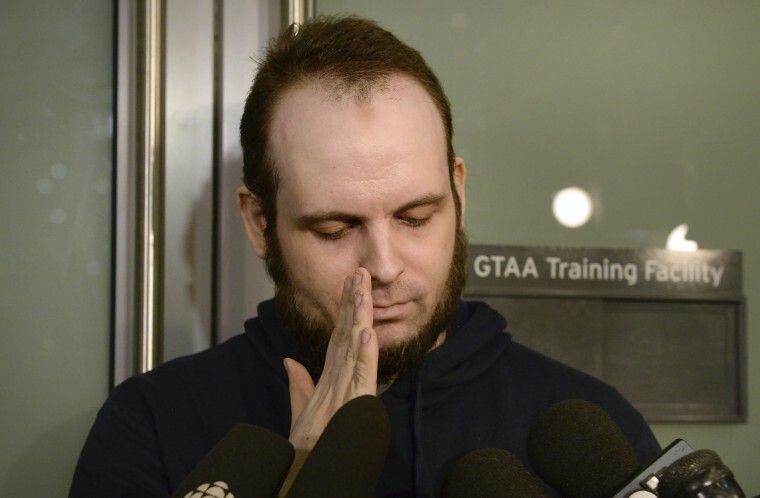 Caitlan Coleman, who was pregnant when she and her Canadian husband Joshua Boyle were kidnapped by militants while in Afghanistan in late 2012, landed in Toronto after flying from London. Boyle told reporters that they were in Afghanistan to help villagers living under Taliban rule. "The stupidity and the evil of the Haqqani Network's kidnapping of a pilgrim, and his heavily pregnant wife, engaged in helping ordinary villagers in Taliban-controlled regions of Afghanistan, was eclipsed only by the stupidity and evil of authorizing the murder of my infant daughter," Boyle said. Members of the Haqqani Network and the Afghan Taliban denied the allegations Saturday. Two senior members of the Haqqani Network, speaking on condition of anonymity, told NBC News that the members were hurt by Boyle's charges, because the group has a system to ensure high-profile captives' security and protection. "Since they are no more our prisoners therefore they can make any statement to get sympathies of the world," one of the members said. "Would you believe someone among us or even fighters would touch a female and particularly if she is prisoner or foreigner?" Taliban spokesman Zabihullah Mujahid later denied that the group killed the couple's infant daughter saying the child became sick while in a remote area without access to a doctor or medication. "It was not intentional," he said in a statement. Boyle said the killing was carried out "as retaliation for my repeated refusal to accept an offer that the criminal miscreants of the Haqqani Network had made to me." He also said his wife was subsequently raped by a guard. "God willing, this litany of stupidity will be the epitaph of the Haqqani Network," he said. "Sic semper tyrannis." His statement suggested the crimes occurred in 2014. The couple has three surviving children who were born while they were held hostage by the group. Pakistan's military said Thursday that they were freed in an operation a military official in that country described as involving sharpshooters who fired at the tires of a vehicle, disabling it, after receiving intelligence from U.S. intelligence agencies that a vehicle crossed into Pakistan on Wednesday. Coleman's father, Jim Coleman, told NBC News in a phone interview earlier Friday that the release of their daughter and her family came as a complete but welcome surprise. "We were as shocked as anyone," he said. "It's an answer to our prayers." "How do you readjust after being held hostage for five years? It's not going to be easy." He said his wife Lynda spoke with their daughter briefly on the phone shortly after their release. "It was a quick conversation. She mostly said that she, Josh, and the children were okay. And that they're looking forward to freedom," Jim Coleman said. "We didn't push her on any details, just happy to know they're safe." He questions why Boyle took their pregnant daughter hiking in Afghanistan, a country known to be dangerous to Americans. "How would you feel if your seven-month pregnant daughter was put in such a situation?" he said. Jim Coleman said they have no immediate plans to go to Canada. "We want to see how things play out for now," he said. "I'm not on the best of terms with my son-in-law, as you can tell." Caitlan Coleman and Boyle were captured by the Haqqani Network, whose leader is the deputy head of the Afghan Taliban. The insurgent group also held Sgt. Bowe Bergdahl for five years. The Afghan Taliban obtained five top commanders in exchange for the U.S. soldier in 2014 in a deal with the U.S. that was brokered by Qatar. The couple had pleaded for their release in propaganda videos released by their captors. In one released in December, Coleman referred to "the Kafkaesque nightmare in which we find ourselves" and urged "governments on both sides" to reach a deal for their freedom. Caitlan Coleman and Boyle married in 2011 during a trip to Costa Rica, about a year before they were captured in Afghanistan. They had three children while being held captive. Two sons are about 4 years old and 2-and-a-half years old, and a daughter is a few months old, Jim Coleman said. The Pakistan military said this week that after it was alerted by U.S. intelligence that the family was being moved across the border from Afghanistan, a team that included infantry and intelligence personnel raced to surround the vehicle. The driver and an accomplice abandoned the vehicle and escaped to a nearby refugee camp, and the hostages were left behind, Maj. Gen. Asif Ghafoor, a spokesman for the Pakistani military, has said. U.S. intelligence officials told NBC News that shots may have been fired during the operation but there were no military personnel present. Boyle told reporters that he did not refuse to board a flight to the United States, as U.S. officials had said. He said there were multiple offers of transportation from different governments. Canada's government said in a statement Friday that "we join the Boyle family in rejoicing over the long-awaited return to Canada of their loved ones," and said it would continue to support the family. Jim Coleman said he hopes their daughter and her family return to the United States, but are unsure of her plans. He said he’s hopeful she accepts a Department of Defense or other program to help them get re-acclimated to life outside of captivity, including psychological counseling for their children. "I mean what do you do — how do you readjust after being held hostage for five years? It's not going to be easy," Jim Coleman said. "We're hopeful, but unsure what lies ahead," he said.